Your physician has recommended that you wear a device for a 24 hour period… But you ask yourself… What is a Holter Monitor? A Holter Monitor is a 24 hour continuous recording of the patient’s ECG. Holter Monitoring is a use test as it provides physicians with abundant information about both the electrical behavior as well as oxygen demands in the Coronary Arteries. 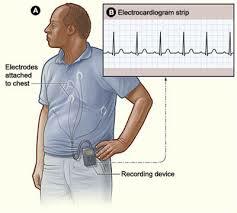 Holter Monitor study is generally ordered by a physician for a patient that has symptoms or suspected activity that is not detected in the 12 Lead resting EKG test performed in the office. These symptoms can include chest pain, shortness of breath, palpitations, syncope or light headedness, dizziness, or skipped beats. The Holter Monitor is an effective diagnostic tools for physicians because it can provide a direct correlation between these symptoms and the behavior of your heart. A Holter Monitor is also useful in patients that have documented Coronary Artery Disease. The physician will often order the study to look for asymptomatic events or those abnormalities that cannot be felt by the patient. The detection of these abnormalities can be a predictor of future adverse events. The other use for a Holter Monitoring study is for patients that already have diagnosed ECG arrhythmias. The continual monitoring of patients with these types of rhythms is useful for physicians to adjust medication and keep a pulse on any changes in these ECG rhythm abnormalities.